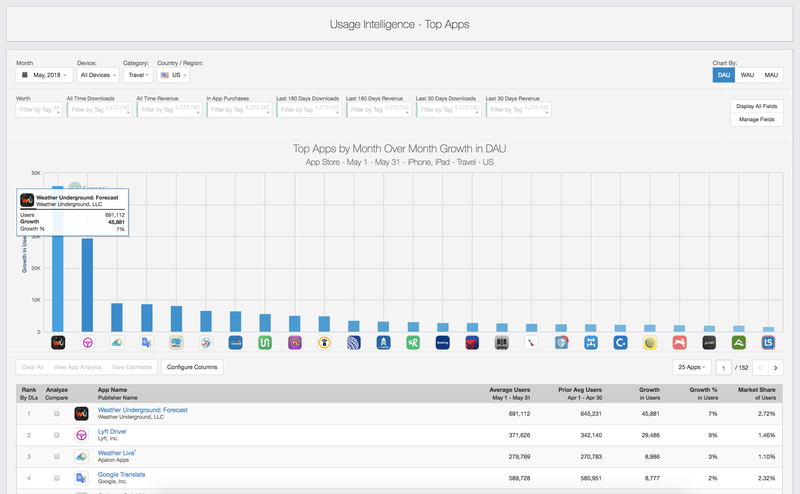 The Top Apps Module of Usage Intelligence gives an overall view of the most successful apps, in terms active users for a selected time period for the App Store, graphed by Daily, Weekly, or Monthly Active Users. This section supplies DAU, WAU, or MAU data for the top 10,000 apps in the App Store for a selected time period that can be broken down by filters (Category, Country etc.) and viewed in graphs and tables with customizable columns. There are three options within the Top Usage Feature to view this data from different angles: Absolute, Growth, and Growth Percentage. 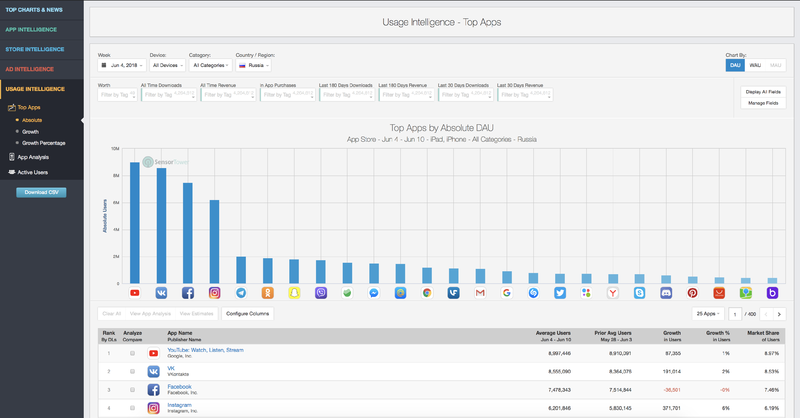 The Absolute View of Top Apps in Usage Intelligence gives active user information for the top 10,000 app's in the App Store. The Top Apps feature pulls in these app's Daily, Weekly, and Monthly Active User counts to illustrate the different amount of use these apps are getting over time. The Absolute rankings are determined by the highest number of Active Users for a specific time period. The app with the highest number of Active Users in the selected time range will be the first in the graph. The table below the graph has the exact data in customizable columns that you can edit to get the view you want. 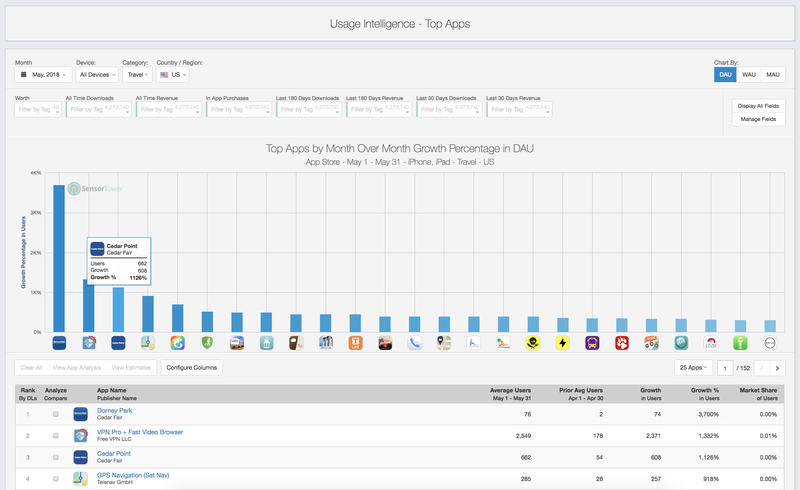 The Growth View of Top Apps, in Usage Intelligence, displays the top 10,000 app's Active Users Growth over time. The Top Apps feature pulls in these app's Daily, Weekly, and Monthly Active User counts to illustrate the different amount of use these apps are getting over time. The Growth rankings are determined by the apps that have grown in Active Users the most from the previous selected time period. The app with the highest growth in number of Active Users in the selected time range will be the first in the graph. There is a table below this graph organized by Growth showing more in-depth data from customizable columns to narrow down exactly what you want to see. The Growth Percentage view of Top Apps in Usage Intelligence, sorts the top 10,000 apps by percentage growth in active users. Similary to the Growth ranking, the Growth Percentage rankings are determined by the apps that have the highest percentage of growth in Active Users compared to the previous time period. The main difference here is that if an app has very few Active Users (~100) and then has a lot more (~10,000) it's Growth Percentage might be very large (10,000%) even though the actual growth (~9,900) in Active Users isn't as large as some apps with millions of Active Users. The app with the highest growth percentage of active users, compared to Active Users of the last time period, will be the first in the graph. Below the graph of the Top Apps by Growth Percentage in active users, there is a table with more details with the data from the graph. This table allows for customizable columns to select the exact data you'd like to see. Usage Intelligence is currently available to Enterprise users only.